WOOT! I made this in under an hour yesterday morning! Not saying the mojo stuck around after I got it put together, but I feel better. So, context. Random, right? Nope. Offspring3 is back in Germany, although not in Bavaria for this trip. 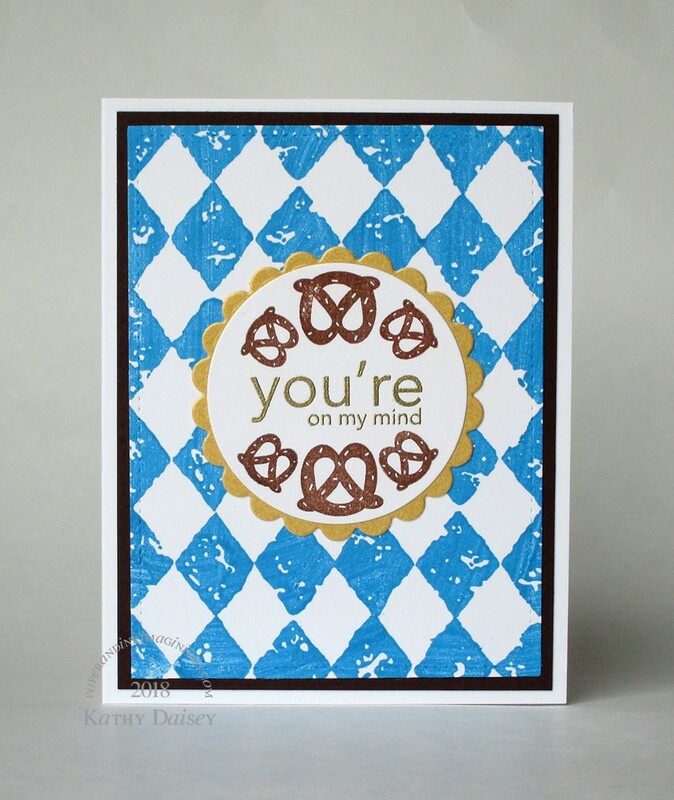 She has sent me photos of brezen (pretzels – YUM! ), that is where the pretzels came in. The blue diamonds are on the Bavarian flag, so that seemed like the perfect backdrop. Looking for a Bavarian flag image to post, I stumbled upon Sheldon & Amy demonstrating what I needed! Offspring3 has already called dibs on this. Supplies: Stamps: Avery Elle, Stampin’ Up!, paper – Neenah Classic Crest Solar White, Stampin’ Up! Chocolate Chip (retired), Stardream Metallics Gold, inks – Tim Holtz/Ranger Distress Ink Salty Ocean, VersaFine Vintage Sepia, VersaMark, dies – Lawn Fawn (stitched rectangle), Spellbinders (circles), embossing powder – Stampendous Detail Gold. Categories: card, thinking of you | Tags: Avery Elle, card, Lawn Fawn, Neenah, Ranger, Spellbinders, Stampendous, Stampin' Up!, Tim Holtz, Tsukineko, VersaFine, VersaMark | Permalink. How sad is it that as soon as I saw the pretzels I thought of Sheldon and Amy. We are so hooked on that show. I’m glad mojo is starting to stop by. Funny thing, I never catch the current episodes, I catch the syndicated ones on TBS or TNT. I had never seen this clip before! We are hooked on the reruns. We tend to miss the current ones too but now that Young Sheldon is on we are more inclined to remember. I hope your mom is healing well. Oomp pa pa! Leave to Sheldon & Amy to have what I needed! AND I can see you looked from Poland!